scoop.it SL Destinations has become my favourite source for picking destinations for my simploring tour. Sunday, March 25th, I came across “Isle of May“, a new sim created by Serene Footman. I was excited seeing a new sim of Serene. Serene’s sims are facinating and bring you to destinations you might never see in the physical world but you can visit them in this virtual environment and you also begin to make some research about these places. Hence it is like a real short vacation. The last place of Serene Footman was Khodovarika and I also saw Dunkirk – La Digue du Braek and Furillen. This said, you know why I was excited to see “Isle of May“. 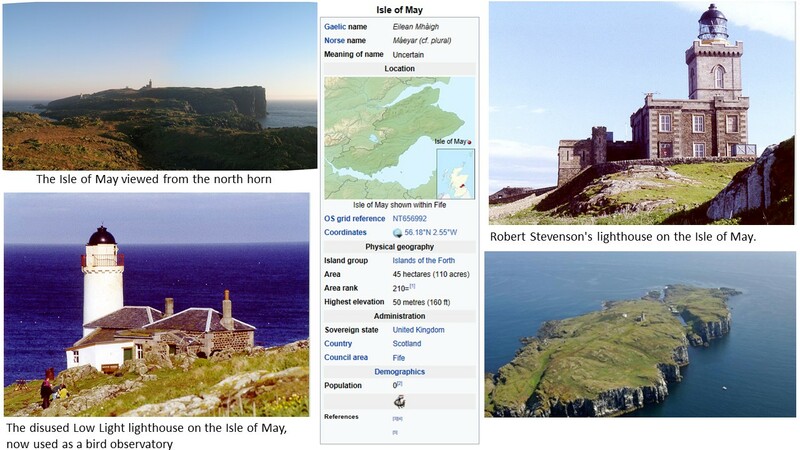 The Isle of May is located in the north of the outer Firth of Forth, approximately 8 km (5.0 mi) off the coast of mainland Scotland. It is 1.8 kilometres (1.1 miles) long and less than half a kilometre wide. Itwas designated a National Nature Reserve on 12 June 1956 and is managed by Scottish Natural Heritage (SNH). Although only around 57 hectares in size, over 285 bird species have been recorded on the island. At the height of the breeding season, the Isle of May can host around 200,000 seabirds, including puffins, kittiwake, guillemots, razorbills, shags and fulmars. These numbers can fluctuate considerably from year to year, depending on weather and fish stocks. As well as its natural heritage, the Isle of May also has a rich cultural heritage, including St Adrian’s Chapel, the Isle of May Lighthouse and others. Most visitors to the island are daytrippers taking the ferry from Anstruther in Fife, although up to six visitors can stay at the bird observatory, usually for a week at a time. The only way to get there is by ferry; the journey takes 45 minutes from the small ports of Anstruther and Crail, and also from North Berwick. The island is closed to visitors from 1 October until Easter to prevent disturbance to the large number of seal pups. The Scottish Seabird Centre at North Berwick has two live cameras on the island, which can be remotely controlled by visitors, to allow close viewing of the seabird cities, including puffins, guillemots, razorbills, shags, cormorants and terns and the fluffy grey seal pups in winter, without disturbance. The Scottish Seabird Centre also runs boat trips to the Isle of May (from wikipedia http://en.wikipedia.org/wiki/Isle_of_May). While the real Isle of May has no permanent residents, Serene’s island is home to a small group of artists, a lighthouse keeper and a ranger who takes care of the island’s birds and wildlife. The sim is on two levels, with a beautiful, peaceful U-shaped cliff top area covered in vegetation and lower beaches on either side. The buildings on the sim are few: the main house stands at the centre of the sim, with a lighthouse and foghorn station to one side and the wildlife keeper’s office together with the ruins of St Adrian’s Chapel on the other. Down below, on small beaches, there are various buildings such as an old stone house, beach huts and a fisherman’s lodge. All around the island there is a wild sea crashing against rocks and cliffs (excerpt from Serene’s homepage). In Second Life the Isle of May offers a lot of places to sit and watch, to listen to she sounds of birds and nature and to look at the wild sea crashing against the rocks. The main house in the center of the island, right next to the landing, is worth to visit also from the inside. There’re several ateliers for artists and the views through the windows are great. I also liked the fisherman’s lodge, that snuggles against the rock in a quite wind protected niche – I got 99 problems and fishing solves all of them. Isle of May is for enjoying the nature and finding some peace, a short vacation just like I expected it. At Serene Footman’s Homepage I found this video about “Isle of May in Second Life” taken by Serendipity Dyrssen. 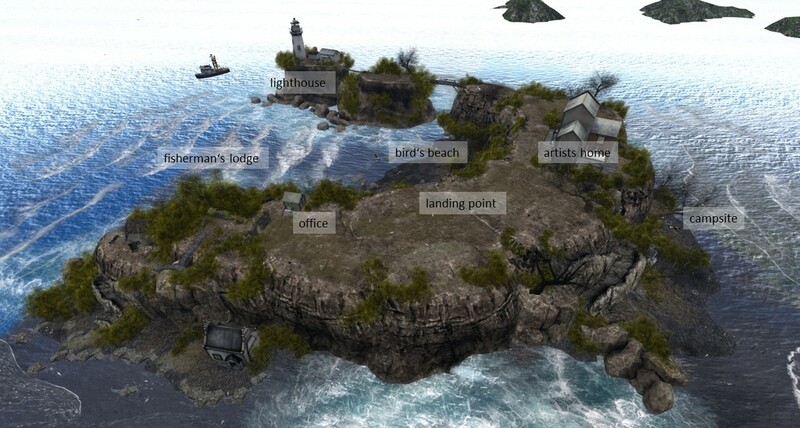 The Isle of May in Second Life was created by Serene Footman and Jade Koltai. A big thank you to both of you!